LOST CROW CONSPIRACY is book 2 in the Blood Rose Rebellion series, and we're thrilled to have Rosalyn Eves stop by to tell us more about it. Rosalyn, what scene was really hard for you to write and why, and is that the one of which you are most proud? Or is there another scene you particularly love? There's a scene near the middle of the book where Anna stands up against the Congress that has gathered to discuss the fate of the praetheria. She's angry, and I needed her speech to feel powerful and still realistic to who she was. In general, writing about politics can be dry, and I worked over that scene a lot to try and convey the energy and tension and build to Anna's (hopefully electrifying) speech. It's not my favorite scene in that novel (I think that would be the ballroom scene at the climax of the book), but I'm happy with how it turned out. Writing this book was difficult for me. I was working on the first draft when the ARCs for BLOOD ROSE REBELLION went out into the world--and that vulnerability, the realization that I'd just invited strangers into the most private workings of my mind and heart, stirred up all of my anxiety issues. I doubted myself; I started anti-anxiety meds and began talking to a therapist I'd see on and off for most of my debut year. Writing under that self-doubt was excruciating at times, but it added a layer of depth to the story. This is a book where Anna begins to doubt herself and her place in the world, and my own struggles with self-doubt let me write a character whose doubts felt authentic to me. Even one of my CPs commented on that--how my own anxiety had led to a richer character. Writing this book taught me that it was possible to write through times of personal crisis, and that those same crises can actually add depth and empathy to a story. 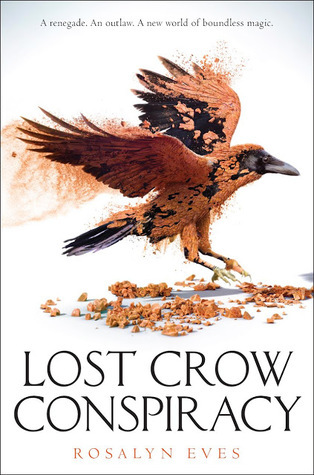 What do you hope readers will take away from LOST CROW CONSPIRACY? Because LOST CROW CONSPIRACY is the middle book in the series, there are lots of questions raised that don't quite get answered in this book. But a central question in the book is about confronting the weaknesses that hold you back from realizing your own potential. After thinking she's "saved the world," Anna discovers that what she did has all kinds of consequences she didn't anticipate, and she's feeling vulnerable and uncertain as to whether her "gift" is actually a curse. Early on, another character tells her, "What you could be, Anna Arden, if you were not afraid," and that phrase recurs throughout the rest of the series--it's a question Anna has to continually as herself as she works through fear and self-doubt; it's a question the other POV character has to ask as well. My hope is that readers will feel inspired by that question as well. It took me a long time to get a handle on the story structure for this book. As the second book in a trilogy, it was essentially the "middle" of the three-part arc of the series, which meant it presents all the same problems of the middle of a book: meandering plot lines, slowed pace, etc. I didn't want any of those issues in the book, but I wasn't sure how to write an arc that resolved enough in the course of the book to satisfy readers, but still leave enough open to resolve in book 3. My "aha" moment came when I realized that just as the middle of a book ends at the dark night of the soul, so the middle of a trilogy needs to end at the lowest point (to date)--in other words, the basic structure of a second book was a tragedy. I'm sure that idea is out there, but it wasn't one I'd heard before, and it changed the way I saw the story. Of course, YA fantasy readers aren't generally looking for tragedies, so I had to balance the series low by resolving one of the secondary plot threads in a positive way. I'm happy with the way the story turned out, and I hope readers are too! Sixteen-year old Anna Arden was once just the magically barren girl from an elite Luminate family. Now she has broken the Binding--and Praetheria, the creatures held captive by the spell, wreak havoc across Europe. Lower-class citizens have access to magic for the first time, while other Luminates lose theirs forever. Austria and Hungary are at odds once more. Anna thought the Praetheria were on her side, content and grateful to be free from the Binding. She thought her cousin Matyas's blood sacrifice to the disarm the spell would bring peace, equality, justice. She thought her future looked like a society that would let her love a Romani boy, Gabor. As threat of war sweeps the region, Anna quickly discovers she can't solve everything on her own. Now there's only one other person who might be able to save the country before war breaks out. The one person Anna was sure she'd never see again. A bandit. A fellow outlaw. A man known as the King of Crows. Matyas. Rosalyn Eves grew up in the Rocky Mountains, dividing her time between reading books and bossing her siblings into performing her dramatic scripts. As an adult, the telling and reading of stories is still one of her favorite things to do. When she’s not reading or writing, she enjoys spending time with her chemistry professor husband and three children, watching British period pieces, or hiking through the splendid landscape of southern Utah, where she lives. She dislikes housework on principle. She has a PhD in English from Penn State, which means she also endeavors to inspire college students with a love for the English language. Sometimes it even works. Her first novel, BLOOD ROSE REBELLION, first in a YA historical fantasy trilogy, is out now from Knopf/Random House. Her second, LOST CROW CONSPIRACY, comes out March 27, 2018. Have you had a chance to read LOST CROW CONSPIRACY yet? Have you used personal crises to ad add depth and empathy to a story? Have you written the second book of a series as a tragedy? Share your thoughts about the interview in the comments! Free #1st5pages Workshop Opens in 1 Week!